Dispenses 10 L/min @ 60 p.s.i. 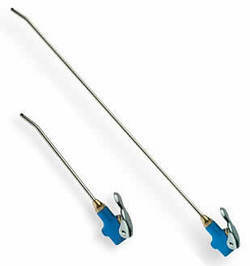 OH&S compliant, this blow gun is designed for use in workplaces where a noise level of less than 80db is required. Nozzle design also prevents 'dead hand' from occurring. Ergonomically correct design Air Boy blow guns fit the hand snugly, with the trigger design making it easy to obtain the precise quantity of air required. Durable & strong Air Boy inlets are made in Denmark from hard wearing Acetal Plastic that's harder than brass. Efficient operation Air Boy blow guns combine maximum air flow with a low level of noise providing good functional properties, operational reliability & long life. Air Boy Straight Nozzle Blow Guns are available in four sizes, from 105mm through to 1,000mm long. These are our longest blow guns, and our ideal for accessing hard to reach areas. Durable & strong Air Boy inlets are made in Denmark from hard wearing Acetal Plastic that’s harder than brass.